Cagayan de Oro City, December 3, 2012 (10.30 am) - On December 16, 2011, typhoon Sendong hit the northern part of Mindanao devastating Iligan and Cagayan de Oro City causing a massive landslides and flash floods that killed more than a thousand of people. Intense rain for several hours resulted to flash floods that swept barangays near Cagayan de Oro River and Mandulog River in Iligan City at midnight where people were asleep after resting early brought by cold rainy night and untimely brown out earlier that day. Photo taken as water subsides after 3 hours of flash flood. 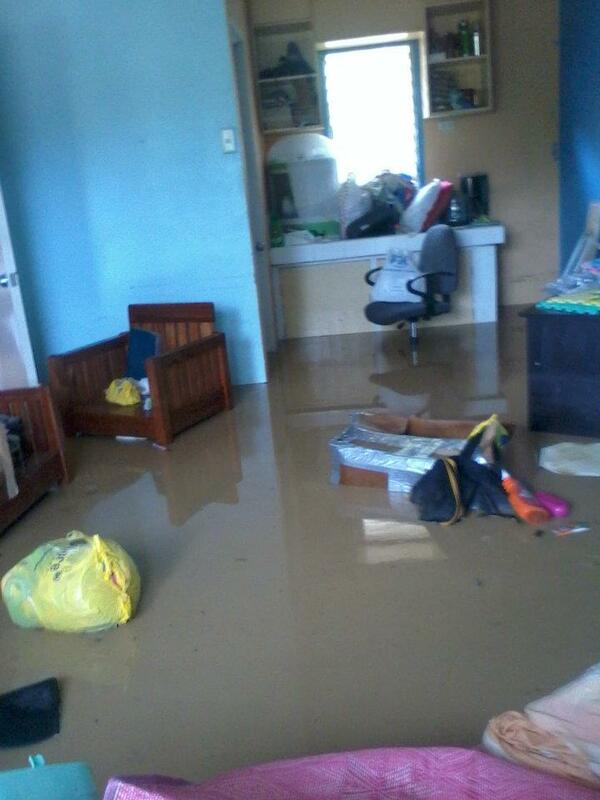 Our home was not sparred by the flood. 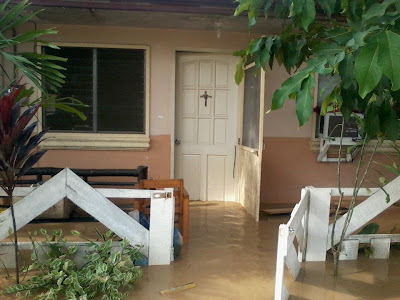 It came in the morning as I was awakened by Emily after the wall of our subdivision was breached and ravaging murky water was filling up the streets. Flood water had submerged our home up to waist-deep leaving some of our home appliances, clothes, and furniture drenched in mud. Cagayan de Oro City was left without potable water for a month after local water utility facilities were destroyed. Power was only restored after 3 days and dust subsided after months of cleaning. Typhoon Sendong sustained winds were at 90 kilometers per hour (kph) or 55 miles per hour and it unleashed more than 200mm (7.9 in) of rain causing the watershed and rivers to overflow. It was the worst storm that hit Philippines in 12 years. 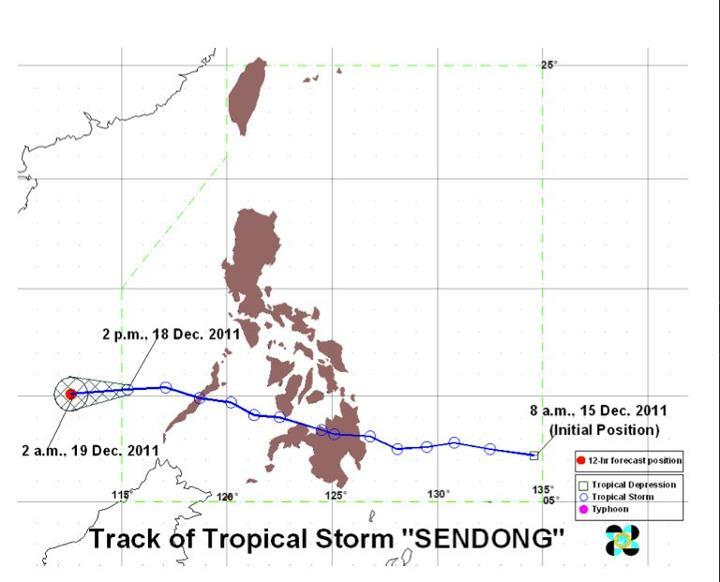 Because of the enormous damage and high death toll brought by Sendong, Philippine Atmospheric, Geophysical and Astronomical Services Administration (PAGASA) had retired the name Sendong in its typhoon naming list. Today, less than a year after, another storm is brewing in the Pacific Ocean and slowly creeping the same path as typhoon Sendong, this time, it is named Pablo (international code name Bhopa). PAGASA forecasted that typhoon Pablo has maximum sustained winds of 175 kph near the center and gustiness of up to 210 kph and will landfall tomorrow morning. As signal no. 2 was raised in my home province, Surigao del Sur, we are now preparing our contingency plan and had done packing our important documents. We had already charged our cellphones and radio and constantly monitoring typhoon updates from PAGASA though its website www.noah.dost.gov.ph. 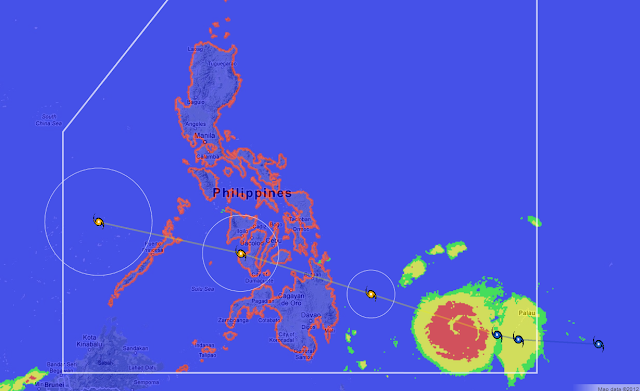 Real time information such as satellite images, typhoon track, rainfall and other data are provided by the website. Unfortunately, their Hinatuan Doppler Radar is currently under maintenance servicing thus it cannot provide rain intensity images but weather stations scattered all over Mindanao could compensate such setback. We already accepted the fact that it will hit us; it is just a matter of how hard it will hit us. We are not afraid of the strong winds but of the rain the typhoon will bring. Cagayan de Oro and Iponan rivers are still clogged up by siltation caused by illegal mining. We are used to typhoon in Surigao del Sur. It is a regular thing for us, and accepted as an act of nature. What scare us are the flash floods. It is a consequence from the acts of man driven by greed, stupidity and foolishness. Oh my gosh, situations like this always brings back bad memories for me when our home was washed away by a tidal wave. I hope you could still salvaged all those furniture. That was a year ago. Yes, was able to save some. Thanks. Hope you're all save as you brace yourselves with another super Typhoon. God Bless... and praying for everyone back home. That was a sad scene. Keep safe always. Hope hindi na maulit ang sad experience mo noon. My prayers are with you Sis. As I read this post, naririnig ko rin yung news about the Typhoon Pablo. I hope things will get better soon..
in times like this all we can hold on to is our Faith and Gods Grace. Keep safe always and better to be always ready and make some contingeny plan to keep safe. My families in CDO have been badly affected by Sendong, too. 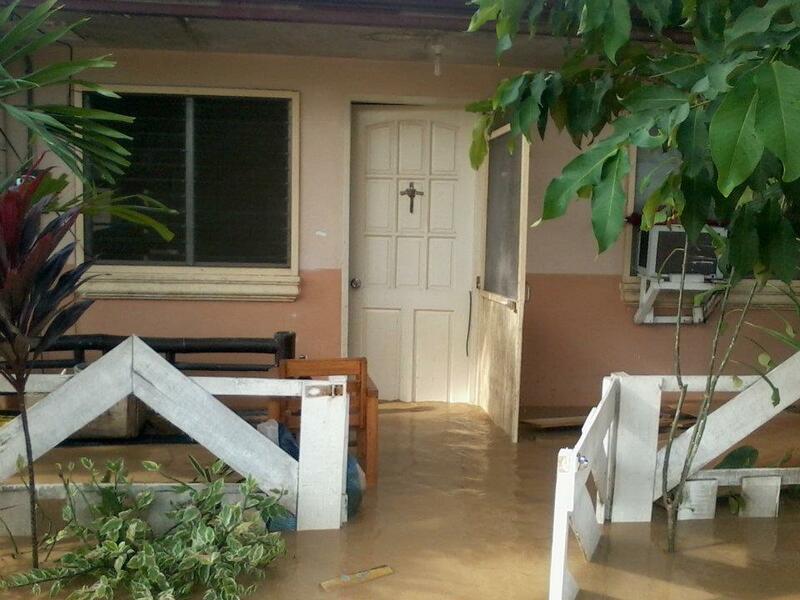 My sister's house was washed out talaga. It broke my heart to see our house flooded. That was during Sendong. I hope and pray that Pablo won't devastate this time around. My families have been on higher ground na, for safety purposes. Ingat kayo dyan! hope you won't have the same experience again and that this time your area and the heavily populated area will be free form flooding. Be very prepared for Pablo this time. It's in the news that it will hit harder than Sendong. Will be praying for everyone's safety. I have heard so many stories during Sendong and my sincerest prayers goes to those were affected and I pray it will never happen again. i really feel sad last year about Sendong, it was the same day we arrived in Manila. reminds me about our border in Makati na taga-CDO their family house was washed out by Sendong...:( hoping and praying that everyone will be safe this time. ingat kayo, ha and be alert na lang. God bless you and your family. I'm so sorry, be prepared for Pablo and I know you are also very cautious and vigilant about it. Thank you Guys and Gals! We're all safe now. CDO was prepared this time. But our brothers and sisters in Compostela Valley got the full force of Pablo. Lets just pray that they can recover soon. oh u got the dates wrong. i hope everything is ok there now. i feel sad when i heard about what happened in Sendong last year. good thing in just a short time, people were able to get back on their feet. thanks to all who help and donate. Ah yes. Had it changed already. Thanks emzkie.